The State of Indiana commissioned American painter Thomas Hart Benton to create the Indiana Murals for "A Century of Progress International Exposition," also known as the 1933 Chicago World's Fair. The continuous mural depicts the state's history—from its earliest indigenous peoples to the Great Depression—via two parallel chronological sequences, one focused on culture and one on industry. I visualized this history as realistic and factual. Realistic as to form, factual as to content. 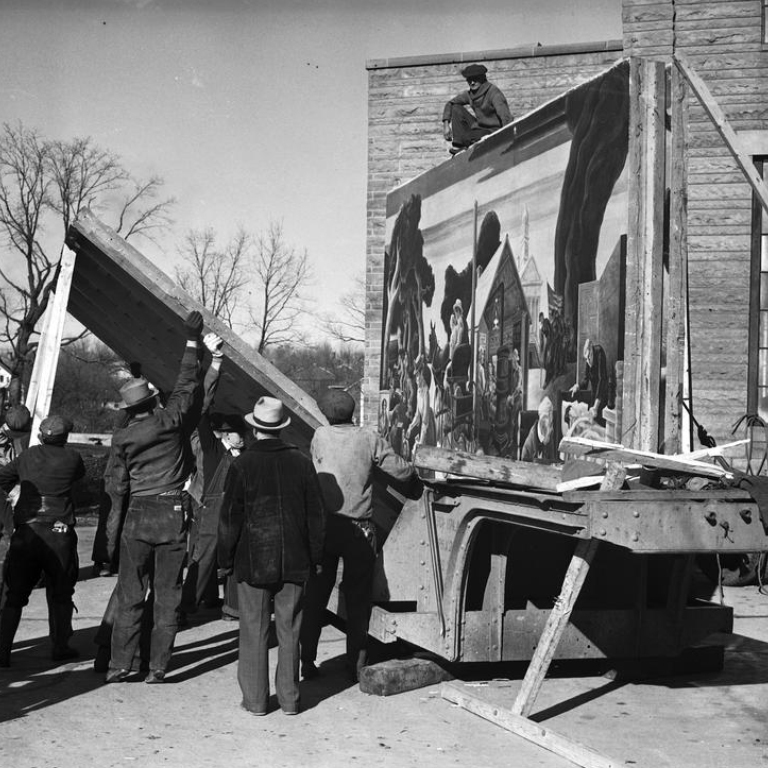 In 1938, Indiana University President Herman B Wells discovered that the murals had been stored at the Indiana State Fairgrounds. A year later, he made their installation at IU a central feature in his campaign to expand and beautify the Bloomington campus as an international center of learning. In its original configuration, the Indiana Murals boasted 26 panels measuring 12 feet high by 250 feet long. After the World's Fair concluded in 1934, the panels languished in storage for five years. When they arrived at IU on December 8, 1939, space limitations made it impossible to install them as a continuous work of art. The university chose instead to install the murals across three buildings in the Bloomington Fine Arts Corridor, placing the 16 central panels in the IU Auditorium grand lobby (now known as the Hall of Murals); four panels with "recreation" themes in IU Cinema (then the University Theatre); and two panels with "business" themes in Woodburn Hall—then the center of IU's new business school. 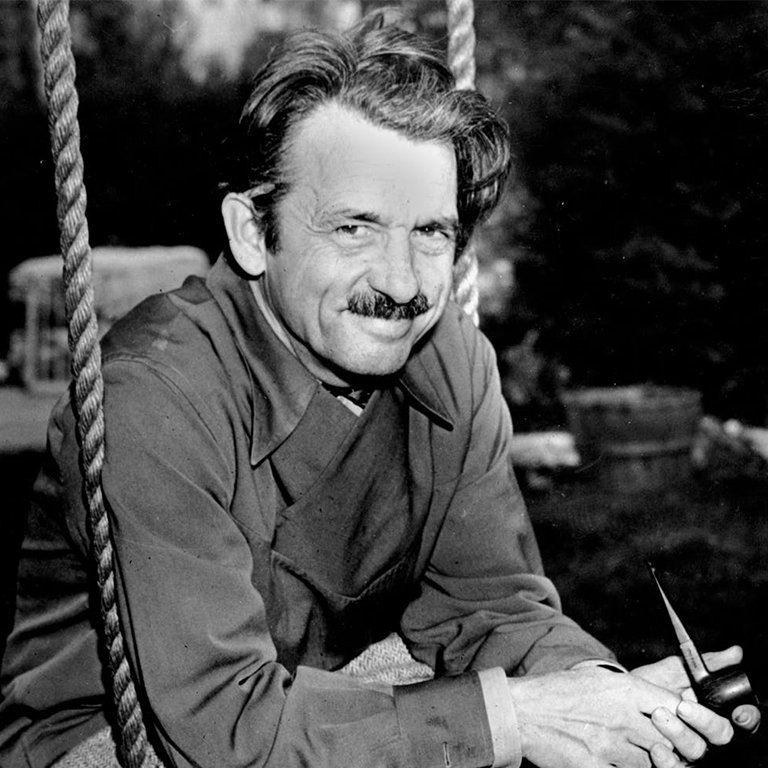 Benton himself oversaw the installation and retouching of the murals. The panels in Woodburn Hall—Cultural and Industrial Panels 10—represent the 1920s. One side, "Electric Power, Motor-Cars, Steel," depicts heavy industry in the Calumet region of northern Indiana. The other, "Parks, the Circus, the Klan, the Press," has sparked controversy since its creation. Are you interested in scheduling a visit to the Bloomington campus? Would you like more information about the Indiana Murals?